Feed the Obsession!!! From big bucks to long-bearded turkeys, we have you covered! Stream the latest episodes right from our website! Our latest season has a little bit of everything. We traveled to Missouri chasing Whitetail. We even travel to Africa on safari. Of course, no season is complete without Michigan turkey and whitetail. We also take our bows out for a bunch of bear hunts and an elk hunt! We would like to take a moment to thank our sponsors. Our show would be no fun without the amazing products that help us to be successful in the field. Please take a moment to visit our sponsor page and check out the name brands that we recommend. If we did not believe in them, they would not be on our page. We use these products because they get the job done. 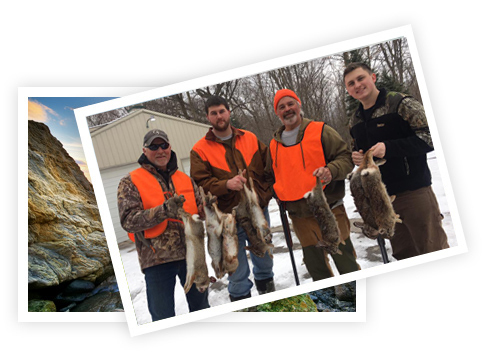 Take a moment and peruse our video gallery of hunting tips. You won't regret it. We will teach you everything from how to propery wind rope, to caping a deer, to mounting and cooking a turkey. If there is anything we haven't covered that you would like us to do a segment on, contact us. We love hearing your suggestions. See photos of our Pro Staff! Who doesn't love looking at hunting pictures? Meet the crew that bring our weekly broadcast to life. You can also read bios from our team members and learn how they got started feeding the obsession! Got it done! Had to set the crossbow aside and use the muzzleloader at 80 yards left handed because of rotator cuff surgery. It was a great three days together in a hunting blind! Pro staff, Noah Craddock of Wildlife Properties in Kentucky, harvested this awesome buck with his bow! Congratulations Noah! Well I got the job done a couple of days before gun season in Michigan! Had to hunt hard for this one. A shout out to our sponsors, getting a nice Michigan buck would not be possible without you guys! Good luck to everyone out there for opening day of gun season! Be safe and enjoy time in the woods, because there's nothing better! What a great week so far in Missouri! I would like to take a moment and thank God for giving me the opportunity to enjoy his great creation and thank my wife for understanding what I truly enjoy! And thanks for time spent with great friends! Memories made while Feeding our Obsession!